Home/Science of Sound/Advanced Topics in Sound/What is intensity? Sound waves are characterized by compression and expansion of the medium as sound energy moves through it. This represents the pressure component of sound. At the same time, there is also back and forth motion of the particles making up the medium (particle motion). Particle motion is described by displacement, velocity, and acceleration. Sound intensity depends on both particle velocity ( ) and pressure (p). The arrow over the symbol for particle velocity indicates that velocity is a vector quantity; it has both a magnitude and direction. The motion of the particles in a sound wave is aligned with the direction in which the wave is traveling. Pressure, on the other hand, does not have a direction associated with it. Diagram of a plane wave. 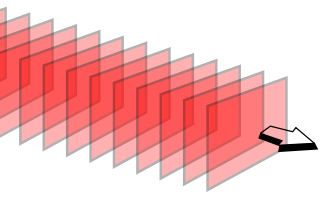 The red rectangles represent wavefronts of a plane wave traveling in three-dimensional (3-D) space. Sounds in water and sounds in air that have the same pressures have very different intensities because the density of water is much greater than the density of air, and because the speed of sound in water is much greater than the speed of sound in air. For the same pressure, higher density and higher sound speed both give a lower intensity. The result is that sound waves with the same intensities in water and air when measured in watts per square meter have sound levels that differ by 61.5 dB. Geophones measure particle velocity, but are more commonly used to measure seismic waves than underwater sound waves. Vector sensors measure particle velocity or acceleration together with pressure to provide direct measurements of intensity, including the direction in which the sound wave is traveling. Vector sensors are used in DIFAR (Directional Frequency Analysis and Recording) sonobuoys, for example. Dr. Dan Russell, Graduate Program in Acoustics, Penn State, Longitudinal and Transverse Wave Motion.